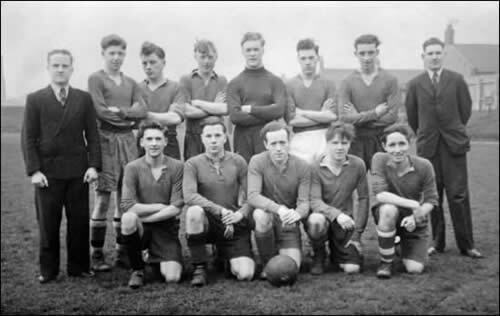 A photo of the Thompson Laing Forge (Sunderland Shipbuilders) football team, at the Fulwell Road sports ground. Taken in the 1940s. I'm guessing this photo would have been taken post-war. The gent on the left looks like he's wearing a de-mob suit issued after the war, and most young men enrolled into the Armed Forces, even though ship building was probably a protected occupation. My dad Ernie Young is in front row, 2nd from left. He's named all the players. Most have passed away now, but he did meet one of them in Australia. Back Row: G. McClum? M.Churchill, H. Whitaker, J. Lithgoa, B. Stevens, J. Goldsmith. Men in Suits - Left: T. Harrison. Right: J. Glass. Front Row: R. Harrison, E. Young, R. Brown, T. Body, G. Barwick. The forge team were never beat in the year that the photo was taken (approx 1948 he said). He was in the R.A.F. just afterwards.